Time was when Nan was an up and coming trekking area – an adventurous alternative to Chiang Mai, Mae Hong Son and so-on. These days though you’ll be hard pushed to find many options on travel agents’ menus. It’s something of a chicken and egg dilemma we reckon and though there are certainly fewer foreign visitors making it up to Nan than say back in the 1990s, and so less incentive to devise and offer such trips, the lack of them isn’t going to encourage potential trekkers to visit this remote province. Agents will point to Nan’s deforestation as restricting potential areas, while -- again perhaps a hark back to the 1970s and 80s’ insurgency problems -- hilltribe villages have been relocated or assimilated into the mainstream Thai infrastructure and culture in a more definitive manner than other areas. Most of the Hmong and Yao villages are less and less distinguishable from Thai villages, traditional dress is rarely seen and more ‘authentic’ looking villages with ‘exotic’ Lisu and Akha just aren’t there. Nan’s unique Mabri ethnic group --formerly encountered on treks as nomadic jungle hunter-gatherers -- have now been settled in a fixed village. Meanwhile the wonderful rafting river the Wa has been dammed in its lower section while elephants from the province’s single camp, near Wiang Sa, have been relocated to Lampang. While conserved areas exist within the confines of national parks such as Mae Charim and Doi Phuka, co-operation issues between government park authorities and private trekking operators don’t always make things easy for the latter. Anyway – all’s not lost and a couple of agents in town do still run shorter trips combining soft treks with sightseeing. Long-established Fhu Travel offer one-day treks (1,500 per person for two, 1,300 for three and 1,000 for four up) or day road visits to H’tin, Hmong andYao communities as well as a visit to the Mabri village for a similar price. They also offer a day tour of the northern part of the province taking in village handicrafts such as silver-making, rattan furniture making, weaving, Nong Bua temple as well as a couple of waterfalls. There’s a southern alternative which includes Sao Din and a short hike in Sri Nan national park. Both are on offer for 1,700 baht per person for two, 1,400 for three and 1,200 each for four people and up. 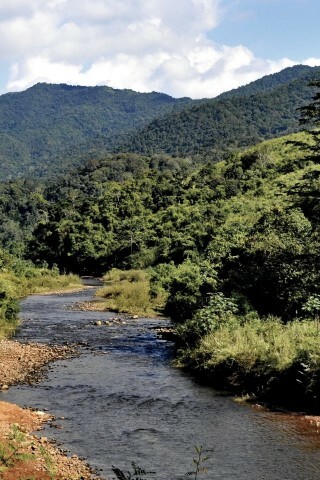 Finally, dependent upon weather and water levels, they may be able to organise a two-day, one-night trekking and rafting option with an overnight stay in a Khamu village and a descent of the upper Wa in Mae Charim national park. The rafting is expensive -- the trip goes for 4,000 baht per person. You can contact the rafting company directly which may save a bit of money but note the rafting is primarily aimed at Thai tourists, so English levels aren’t guaranteed (and Thai tourists keep costs down by simply cramming a lot of people in the raft). Fhu Travel: 453 Sumondhewaraj Rd; T: (054) 710 636, (091) 287 7209; fhutravel@hotmail.com. Nan River Raft: T: (054) 710 940, (081) 472 8951. Last updated on 27th January, 2016.